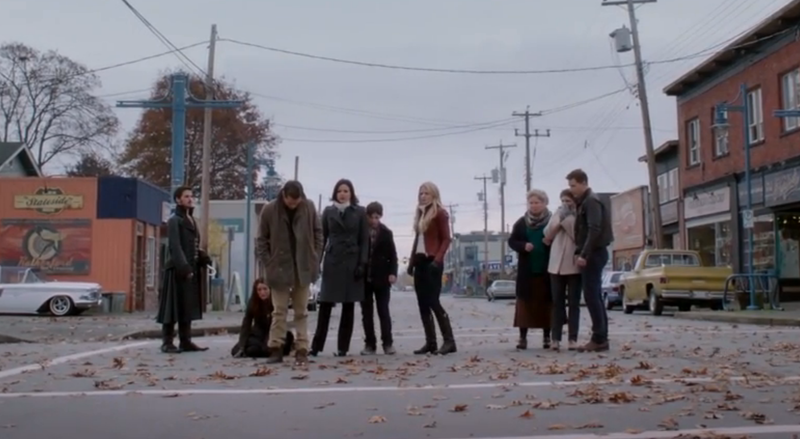 In a winter finale that acted at times more like a series finale, “Going Home” marks the end of the first half of Once Upon A Time’s 3rd Season. But with endings, come new beginnings. So let’s bid one final farewell and tie up this tale of life in a small town called Storybrook, Maine. With the need for the wand of newly revealed Dark Fairy who was banished ages ago, the crew sets out to the church where Blue and the other fairies have been residing. Before they can search the place properly, Pan’s Shadow bursts in once more looking to stop them. Tinkerbelle destroys Pan’s Shadow once and for all by capturing it and throwing it into the fire. With Tinkerbelle finally believing in herself again, she is able to make the pixie dust work so that she can fly and capture the shadow once more. This time, she ends it by throwing the captured shadow into the fire, destroying it and freeing all those it had killed over the years – including Blue. With the black wand in hand and Tinkerbelle earning her wings back, the group makes their way back to Mr. Gold’s shop. Last week I listed the ingredients needed to enact the Dark Curse and wondered if Pan had what it took to cast it. Not surprisingly, Pan ripped out Felix’s heart after revealing that ‘the thing you love most’ could also stand for the thing that has the most loyalty towards you – which keeps continuity of how sacrificing her father worked for Regina. 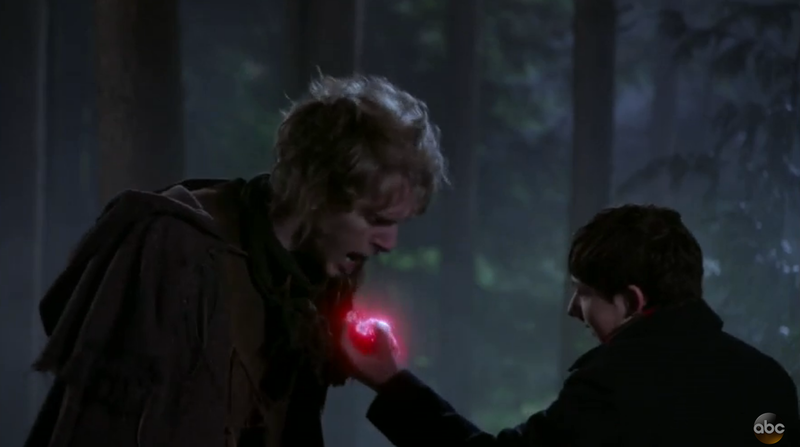 Pan (in Henry’s body) rips out Felix’s heart without a second thought. With the curse recast, Rumplestilskin revealed that only Regina would be able to stop it. Once Henry and Peter Pan were back to their original bodies, Regina was able to get the scroll and learn that undoing the curse would destroy Storybrook and send all those from The Enchanted Forest back home. 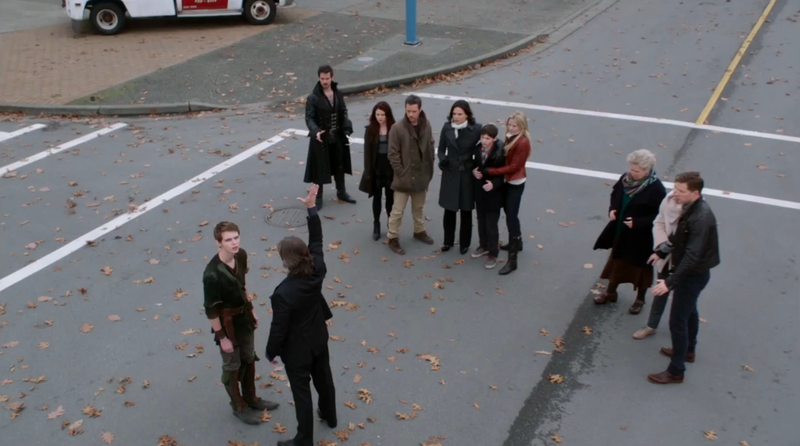 Realizing this includes everyone but Henry, Regina tells Emma that she must stay back with Henry. After tearful goodbyes, Regina gives Emma and Henry new memories so that they might live happily ever after. The residents of the Enchanted Forest give Emma and Henry a tearful goodbye before Pan’s curse catches up with them. One of the ongoing mottos of Once Upon A Time is that evil (like good) is created – not born – and thus can be redeemed. We’ve seen villains such as Rumplestilskin, Regina, and Hook get second chances. Cora never lived long enough to see one, but at least in her final moments we learn that everything she did was truly for her daughter. At his very core, Peter Pan was a selfish manipulative drunkard who couldn’t even fathom caring for anyone but himself. He sacrificed any chance of redemption long ago and thus became a whole new kind of evil. One has to wonder just how evil any upcoming villains might be. While the others are frozen by Pan’s spell, Rumplestilskin summons his shadow so that he may reclaim The Dark Ones dagger and finish Pan off once and for all. There’s an old saying about how ‘one meets his destiny on the path he takes to avoid it’. We’ve certainly seen this happen with Rumplestilskin time and time again. 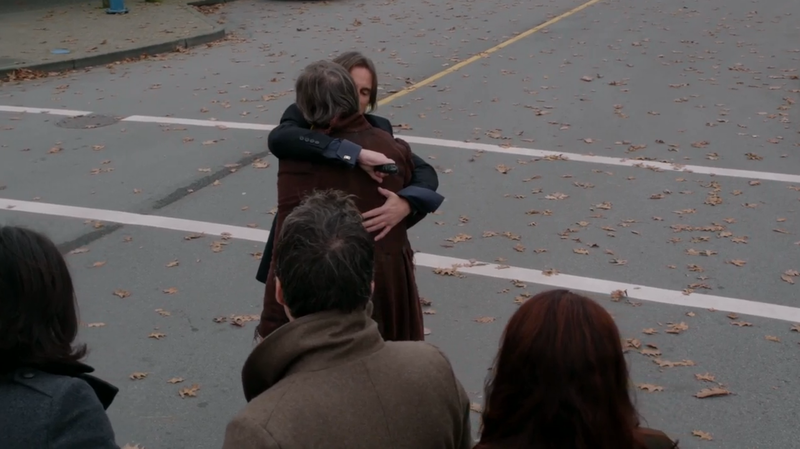 Since we learned about Henry being foretold as Rumplestilskin’s downfall in Season 2, Mr Gold has struggled between doing what is right and his inherited need for self-preservation. By accepting his fate and sacrificing himself, Rumplestilskin does a lot more than just defeat Pan physically. He rejects the selfishness need of self-preservation he’s seen his father exhibit time and time again. By making a selfless sacrifice, he is able to stop the selfish monster known as Pan. 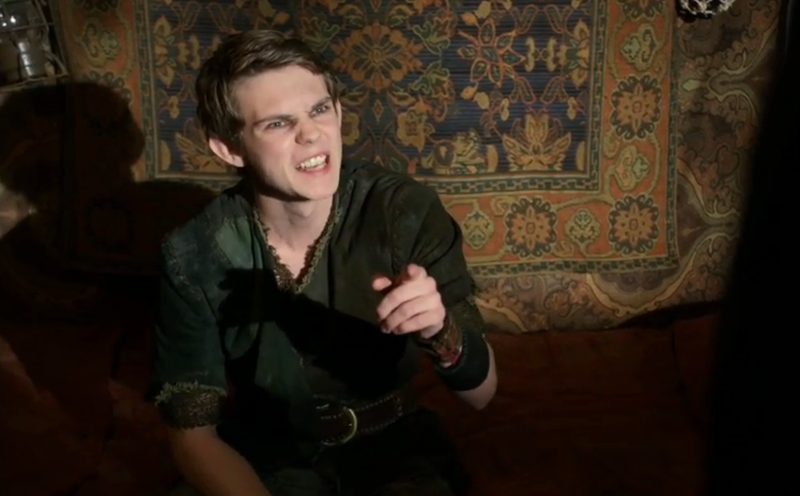 Rumplestilskin plunges the Dark Ones dagger into Peter Pan and himself, causing Pan to revert back into his true old self. 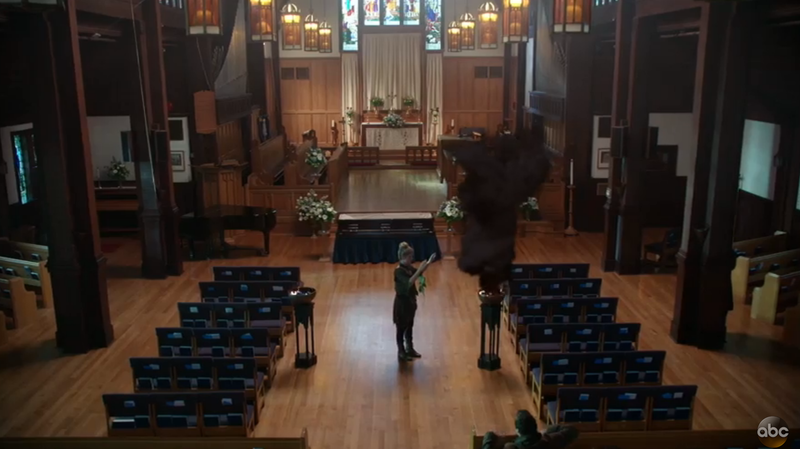 No Body – Rumple and Pan disappeared in a bright gold flash. Now you might think Pan could return too, but no. He reverted back to his true old self so his powers are indeed gone. Accepting Fate – We’ve seen prophecies come true when Rumplestilskin fought against them, so by accepting them maybe he can rewrite it? 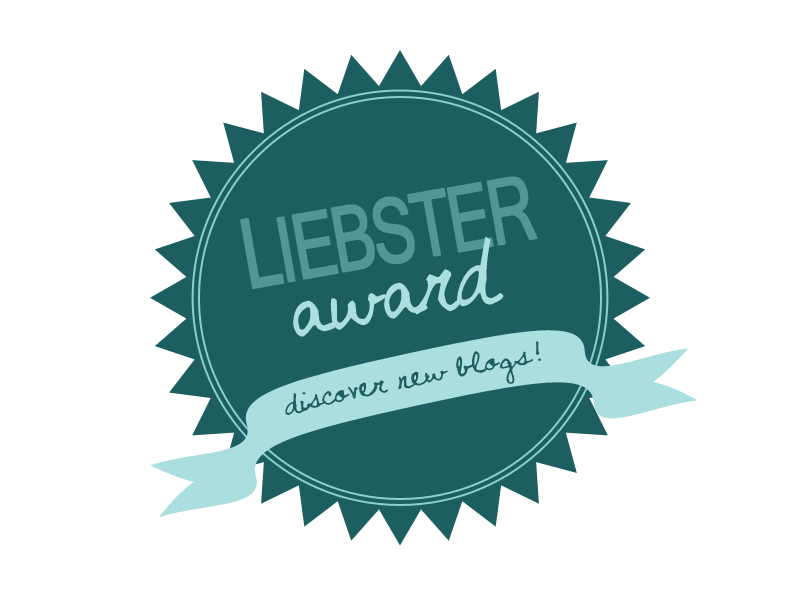 The Dagger – Whoever holds the dagger controls the Dark One. Kill the Dark One with his dagger, and you become the Dark One. Suicide was never mentioned in the handbook. Also considering Zoso – the Dark One before Rumplestilskin – needed Reumplestilskin to kill him, I’m assuming suicide via dagger wasn’t an option. Let alone a righteous selfless suicide. Writer Spoiler – Earlier this month, Adam Horowitz said in an interview that unlike the first half of the season, Rumplestilskin and Belle are “going to be in the same world for an extended period of time.” Now to be fair, co-creator Eddy Kitsis added a more cryptic spoiler in which he says the second half will explore their relationship “in whatever state that is”. Hoping true love can break any curse, Hook greets Emma with a kiss so that she can remember who she is and help him save her family back in The Enchanted Forest. In the final moments of this episode, we flash forward a year later to see Emma and Henry enjoying their ‘happily ever after’ until a familiar face appears at the door. Hoping for a kiss to break the kiss, Hook returns and tries to persuade a skeptical Emma about how her family is in danger. After a quick knee to the crotch, Emma kicks Hook out and wonders who left the door open downstairs. 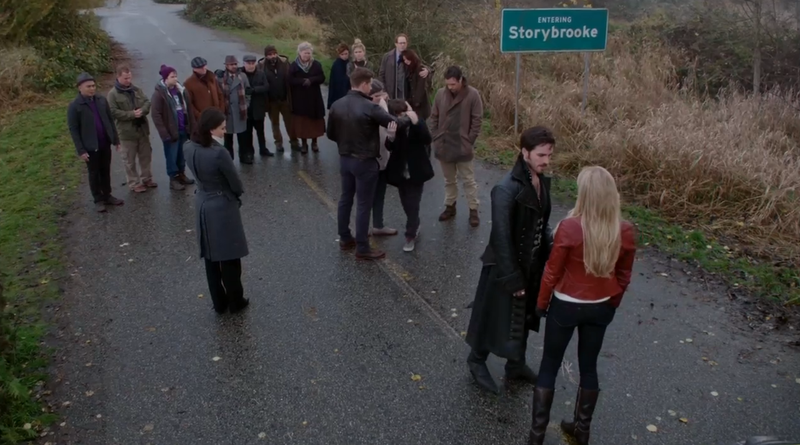 What happened to Snow, Charming and the others? How can Hook get Emma to remember? Who is this new villain and what does she have planed? Rebecca Mader joins the cast as The Wicked Witch of the West when Once returns March 2014.